Wheel bearing shop cost? OEM part only? 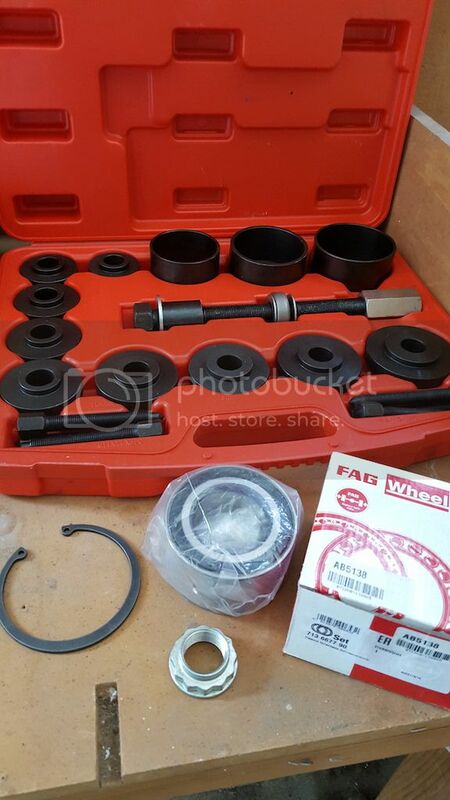 In case anyone is interested, here's what an FAG front bearing kit looks like, along with the bearing tool that won't work on the front - but worked brilliantly when installing the rear. That kit looks almost like what I used from Harbor Freight on my front bearings - you said there wasn't a big enough cup to press it out though? I tried to get the HF kit or one like it but no dice - and these suckers are heavy so shipping was out.... This one was available locally and is a decent kit but the largest receiver cup is 91mm O.D. - too small for the front bearing. Not a problem, as I"ll make up a receiver cup to expand the kit when/if I do the front. I bought the front bearing as I was convinced that it was a failing front bearing making all the noise. Comments from a local indy backed that conclusion. I had some long trips I had to make, so I carried the bearing just in case I had to get a mechanic to fit it while I was out of town. Time (and distance) showed the bad bearing to be a rear, so I bought the above bearing tools and a rear beaing kit and sorted it, knowing the tool needed additional items to be usable on the front. Re. Figuring out which bearing is bad, these X5s drone like a fleet of WWII bombers when a bearing goes bad and it can be maddening trying to locate the bad bearing. Due to the massive width of the bearings they rarely develop any discernable play until well after they become very noisy, so turn tests and wheel-wiggles don't help much in the early stages. Can someone recommend the appropriate tool for the FRONT bearing? A link to ebay etc. would be appreciated! The tool I mentioned previously will not work on our X5. OE bearing for an M car is a good idea but may try next time. Last edited by master1917; 02-16-2019 at 09:20 AM. Had front left wheel hub bearing replaced for noise at 100k km (not miles) on my E70 X5M. Shop insisted OE only and I paid C$550 for a part + C$360 labour so C$1,000 with tax for a bearing. There are C$50-C$200 bearings with matching part numbers on ebay, so I may try next time. Thought better go with OE, but may cut corners in the future and take some risks with some parts available as non-OE as dealer prices for parts are..... high. Not sure if non-OE bearing for an M car is a good idea but may try next time. Last edited by master1917; 02-16-2019 at 10:36 AM. Most of the ebay $50 bearings are Chinese stuff, unless specifically stated made by SKF, FAG brands etc. Most BMW bearings are made by SKF or FAG companies. For ex, your 2001 BMW X5M Front bearing is likely PN 33206795960. BMW dealer is US $300. SKF is about US $160. Thank you, biase aside, how bad are Chinewse bearings for $50? Anyone tried? Mileage?